6 Professional Weight Loss Tips. You've made slimming your most important new season resolution? The following 6 professional weight loss tips help you get definitely rid of extra pounds. The most important thing to remember when desperate to lose weight is, that nothing can help you achieve your slimming goals if you don't make small changes in your lifestyle. The 6 professional weight loss tips below teach you how to get used to the consumption of vitamin-rich and low-calorie meals. Purchase only diet-friendly ingredients which load your body with energy and ease the job of your digestive system to break down nutrients and eliminate toxins. Skip butter and other calorie-rich ingredients you usually match with French toast. In order to reduce the fat content of this delicious breakfast all you have to do is team it up with egg whites and low-fat milk. These protein-rich food items will balance out the calories from the French toast. Use this simple expert trick to lose weight dramatically. Save hundreds of calories by swapping French fries with brown rice. Re-think all your favorite recipes and prepare ambrosial salads using low-calorie brown rice. Let these food items give you a sense of fullness for a longer period of time. Resist the temptation of cravings with nutrient main meals using fat burning ingredients. There's a huge nutritional difference between plain yogurt matched with fresh fruits and common fruit yogurts. Indulge in a tasting-bud-pampering gourmet experience by preparing your own delicious snack. Choose vitamin-rich fruits and add it to Greek yogurt. Eliminate fruit yogurt from your fridge to save loads of calories per snack. Soda is definitely your greatest enemy when desperate to lose weight. In order to save hundreds of calories you must learn the art of preparing DIY spritzers. Use organic fruit juice and Seltzer water to create a delicious and vitamin-rich beverage. Keep the bubbles and eliminate excessive sugar and artificial ingredients to drop a few stubborn pounds in a flash. Going only for leafy greens, lettuce and cucumbers will not keep monotony at bay. In order to maintain the versatility of your diet include colorful vegetables into your meal plan. Food items like: carrots, eggplant, orange peppers, spinach and purple cabbage will add a diversity boost to your diet plan. Trick your brain to consume more veggies which flush out fat from your system. If you plan to have a generous dinner or lunch, don't forget about this trick to balance out the calorie and carb intake. 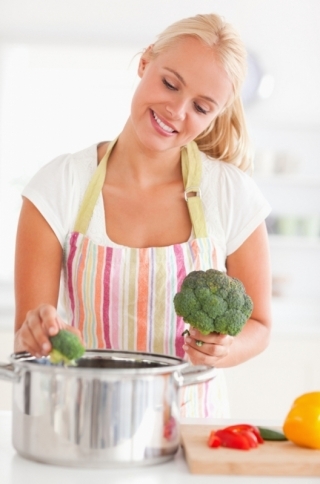 Team up main meals with steamed veggies to ease the task of your digestive system. These vegetables are packed with nutrients and can be digested easily. Baby carrots, broccoli as well as cauliflower serve as the best option for a delicious side-dish.